Put your bags down at the Brit Hotel Salon de Provence for a memorable stay in the PACA region! The Brit Hotel Salon de Provence – Azur hotel is close to the city center and only 20 km away from Marseille-Provence airport. We welcome you at the reception from 6:30 am (7:00 am on weekends) to 11:30 pm every day. Outside these hours, a key collection point is at your disposal. A luggage service is available at the reception desk. Park your car for free in our closed private parking! Our Salon-de-Provence hotel has 38 recently renovated rooms. Double, twin or family room, you’re guaranteed to find the option that perfectly suits you! Our hotel also has 2 disabled access rooms. 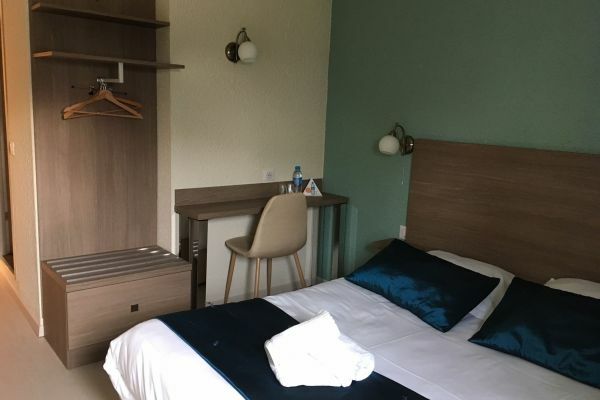 Each room has all the necessary equipment for a successful trip: a high-quality mattress, a private bathroom with a shower, a telephone, free Wi-Fi and a flat screen TV with Canal +. Each morning, enjoy our delicious breakfast buffet… Many restaurants are open near our hotel for lunch and dinner. We also have a catering service for overnight stays. Relax and soak up some sun on our terrace or get cosy in our TV lounge. Our Salon-de-Provence hotel also has a meeting room for your seminars and training sessions. Your pets are welcome for an additional fee of 8 euros. Choose the Brit Hotel for a great time in Salon-de-Provence! La situation en zone industrielle, le long de la nationale.